An organic-waste-to-energy project in Connecticut USA begins producing electricity this year, demonstrating financial and environmental benefits achievable locally and globally by converting up to 40,000 tons of organic waste annually into environmentally harmonious green energy and dry bio fertilizer. 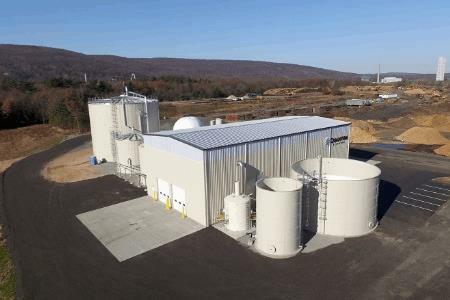 The Quantum Biopower Plant serving the central Connecticut region incorporates its GWE RAPTOR rapid anaerobic digestion system at the heart of its process that harvests mixed organic wastes for conversion into enough biogas (primarily methane) to generate 1.2 MW of electricity and up to 5.6 tons a day of dry bio fertilizer. Biogas extracted from the refuse replaces fossil and other fuels typically used to generate electricity for the nearby Town of Southington, CT, reducing its environmental footprint and helping the State meet its renewable energy goal of generating 27% of the state's electricity from renewable energy resources by 2020. The Southington plant’s biogas production of more than 420,000 Nft3 (about 12,000 Nm3) a day @62.5 per cent methane (CH4) is equivalent to 8,000 kg a day of fuel oil, or more than 3,000 tons of the fossil fuel a year, projected to be worth over $A10 million in the plant’s first decade of service. The plant began accepting food waste in December 2016, in preparation for electricity production this year. Adjacent to Quantum Biopower’s anaerobic digester building are a pair of million-gallon tanks (approx. 380,000 liter tanks) where high levels of heat are applied to the liquefied trash produced by the anaerobic digester. The super-heated liquid becomes the methane gas that is being used from this year to produce electricity for Southington’s municipal buildings, sold to the town at a reduced rate that will lower what the town spends on energy annually for the next 20 years. “An enormous advantage of this type of green energy is that it transforms an environmental problem into a profitable resource. Rather than having to pay to dispose of organic trash – or having it rot in landfills or create community odor issues and environmental hazards – this process converts virtually any organic waste into a profitable asset,” said Global Water & Energy Vice President, Mr Ian Page. “This very successful Quantum Biopower plant, incorporating the latest RAPTOR waste-to-energy technology, illustrates the huge benefits available to virtually any application producing a biological waste stream, including municipal or industrial facilities, food and beverage processing plants, or agribusinesses. “As well as profit and environmental benefits, this technology provides consistent and reliable base load power, which is not always possible with alternative green energy technologies, such as wind and solar. It is a proven winner,” said Mr Page, whose company (a subsidiary of Global Water Engineering Engineering) has also successfully completed a RAPTOR waste-to-energy plant in Canada and is currently completing another in the Caribbean that converts food waste and a form of grass to energy. GWE’s RAPTOR (which stands for Rapid Transformation of Organic Residues) is a powerful liquid-state anaerobic digestion process that consists of enhanced pre-treatment followed by multi-step biological fermentation. In the Quantum Biopower application, it is integrated into a process that begins with waste reception and conditioning, then thermophilic acidification, anaerobic digestion by the RAPTOR process, post-digestion treatment then aerobic treatment of the liquid fraction of the digestate in a membrane bioreactor. Sludge conditioning and biogas conditioning and reuse take place in a cogeneration plant (Combined Heat and Power, or CHP plant). The RAPTOR process consumes a high level (72.3 per cent) of the potentially environmentally harmful Chemical Oxygen Demand (COD) content of the waste, which comprises content of natural origin that can be broken down into biogas by anaerobic bacteria. The Southington system also achieves high levels of Total Solids (TS) and Volatile Solids (VS) conversions to biogas, attaining 79.1 per cent and 84.1 per cent respectively. GWE has successfully built and commissioned over 200 biogas utilization plants for clients worldwide over the past 15 years, including anaerobic plants that extract biogas from agricultural waste and wastewater. GWE’s RAPTOR process has won a global environmental engineering award for the process by which it transforms food processing sludge waste from an environmental problem into profitable green energy. THE IChemE Energy Award was made by the Institute of Chemical Engineers (IChemE), which represents more than 40,000 chemical engineers worldwide. The award recognized the best project or process to demonstrate innovation in renewable energy, alternative energy sources, efficient energy use or the development of energy production methods that reduce energy and water intensity. Agro-industry residues, like starch and sugar pulps, vegetable or potato waste. Industrial residues, such as brewery waste (spent grain), fruit processing waste, and paper mill sludge. Energy crops, for example corn (silage), various grasses, algae. Biological waste from a wide range of specific user types targeted by Quantum Biopower, including universities, grocery stores, restaurants, food transporters, hospitals, sports arenas, large office complexes, commercial buildings and large residential complexes. “The next frontier of recycling is your hometown,” says Quantum Biopower. “Recycling and waste coordinators across the globe are seeking innovative ways to remove organic waste from their landfills in an effort to be more responsible stewards of the environment while saving money”. North Americans are the largest producers of garbage in the world. According to the US Environmental Protection Agency, (EPA) each person in the US produces about 4.62 pounds (2.1 kg) of municipal solid waste every day. This means that the United States alone produces more than 250 tons (about 250 million metric tonnes) of municipal solid waste annually. The diversity of the material to be processed means a range of different RAPTOR pre-treatments are available, to allow the highest possible conversion efficiency.